Lately, I have been a bit down in the dumps since I am stuck inside with the cold weather. While I love winter fashion, I hate the gloominess of winter and not being able to enjoy the the sun being out much. Even worse, the promised “Snowmageddon 2015” didn’t happen in the area where we are staying, leaving me bummed since I really wanted to see Reya play in 2 1/2 feet of snow. To get out of this funk, I decided it’s time to start being creative and start making some beauty items. My problem was I didn’t bring most of my soap stuff with us, and had no clue what I wanted to make. As I was doing some research online, I found the perfect solution for people like me who love making beauty items or the though of having full control of what ingredients go into their cosmetics – the Handmade Beauty Box. 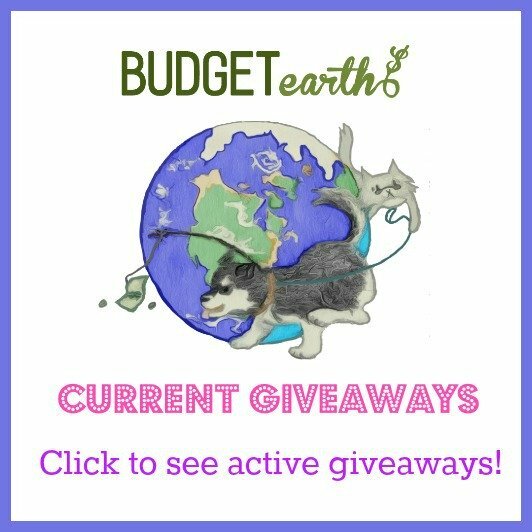 Handmade Beauty Box: What Is It? Looking for fun weekend projects for the weekend where you can enjoy spoiling yourself or having a pamper party with your favorite girls? If so, we think you will love the Handmade Beauty Box! This do-it-yourself beauty subscription box service delivers high-end, achievable beauty and spa products right to your door. In the box, you will find everything you need to create some of your own toiletries and cosmetics, including lotions, lipsticks, nail polish, mineral makeup, foots scrubs, and more! Each project also uses only the highest quality, wholesome ingredients such as essential oils, shea butter, pure pigments, and salts in the boxes to make sure all the projects are not only luxurious, but natural. As well, many of them can be customized to suit your individual skin tone or color preference. All the projects are also have pre-measured ingredients and step by step instructions, making it easy for everyone to make projects. If you get stuck for some reason or want to modify the receipt, you can go the their blog to watch video tutorials or get other ideas. Okay, I will freely admit, I was super excited when I got this box to review. I have mentioned before on the blog that I like making my own soap, and one of my favorite places to buy stuff from is Bramble Berry Soap Supplies. They have some of the best products for soapmaking, including essential oils, and I love watching their tutorials created by their founder Anne-Marie Faiola aka “The Soap Queen”. When I found out she created the Handmade Beauty Box, I knew it had to be amazing since I haven’t tried anything from her company that I don’t love. When my box arrived, I couldn’t wait to get it open and see the project was inside. 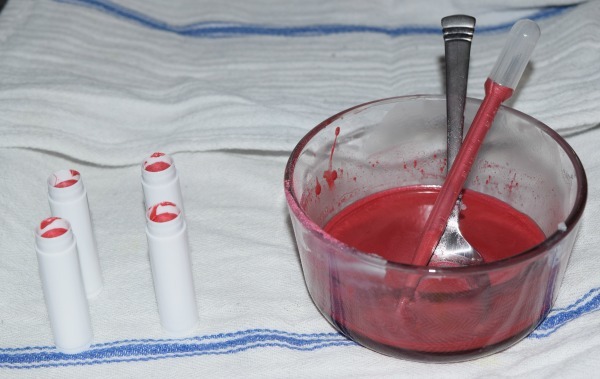 I was even more curious when I saw I would be making homemade lipstick. While I was comfortable with many of the products inside, it was a project I had never attempted in the past so I knew I would be in the same boat as most of my readers – trying it for the first time. Once I got started, however, I was completely blown away. The project itself was very easy, practical, and made me truly feel like buying lipstick in a store is a total rip-off. I mean, I just made an army of lipstick, and had the chance to try have fun making some custom lipsticks. Since I got more than one box for review, I really had fun making custom colors and am planning on going into my own collection of mica to make more. After this experience, I can’t wait to try more boxes and test out more projects I didn’t think I could possibly make at home. Based on my own experience I don’t think I could recommend the Handmade Beauty Box enough, and I give it an A+ rating! If you love beauty items, and do-it-yourself projects, buy it now – it is not only fun but will show you how easy it is to make beauty products at home! Want to purchase this awesome DIY box for yourself or someone in your household this Valentine’s Day? You can learn more about this box and order a box to try it out for yourself by visiting the Handmade Beauty Box website. This box itself is currently available for only $31.50 a box or $28.79 with a subscription (shipping included), allowing you to enjoy step by step projects every month! Best of all, you don’t have to be a subscriber to enjoy the box. You can decide to purchase them one at a time or sign up for monthly delivery based on a 3 month, 6 month, or 12 month subscription plan. 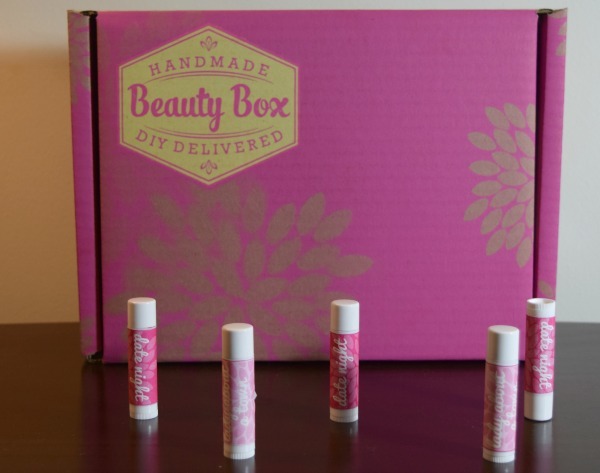 With the Handmade Beauty Box, making beauty items just became a whole lot simpler! Want the learn more? Check out the Handmade Beauty Box on Social Media! This would be a great box for me. I love making bath salts and this will help me branch out into making more things. This is so cool! Thank you for sharing this review with us. This is such a great idea. Very cute and a great gift idea. Woo-hoo! This is just what I’ve been looking for! I used to make soap, lotion bars, bath salts, and body butter, and want to get back into it. This PERFECT for me!! Thank you! Omg I’m so glad I found this, this is awesome. I totally know what you mean about being inside and down in the dumps winter can be so boring and I’m always looking for things to keep me busy. I love making things especially things that are useful. That sounds very nice. It really would cheer you up to receive one of these Beauty Boxes. But it would be nice to get them more often. This is awesome. I am so excited I came across this. I love DIY projects. My daughter and I make things all the time from things we find around the house. The only thing that I’ve ever made is candles. I’ve been wanting to make soap.Making lipstick sounds like fun. I could finally get the exact shade that I want. My teens would love this, they spend so much at Lush. this is something new i have never heard of, to get beauty boxes and make your own. i wonder if the products turn out as nice as the products sold at Lush, which i love the way the store smells. i think this would be a good idea for a teen sleepover party..
Love this, its full of beautiful things that here in WV, I sure could use. Fingers Crossed. Thanks for sharing. I like anything that is natural and home made is even better. I would LOVE to win this! I love handmade bath and beauty products, and being able to make my own sounds like so much fun! This is so cool! Would love to try to make my own lipsticks! What fun! Maybe I’d actually be able to get a color I like for once! I Love the fact that you know exactly what ingredients are in your beauty products. This sounds fabulous. I have always wanted to try and make my own natural beauty products. Natural is the only way to go, from soap making to bath bombs and lip moisturizers and make up. I’d like to know how I’d like it before I started wearing and making it. Thanks for sharing this review. I love DIY projects! This would be fun…and helpful! This sounds amazing. Love it already! It’s too bad they don’t let you pick which type of product you’d like to create. It’s supposed to be a surprise but some of the products you can make don’t interest me. I love the idea of a DIY beauty box! I especially love that some items are customizable to skin tone. Being pale makes it harder for me to find great shades. These boxes make the perfect Gift!! My granddaughter who is almost 17, loves makeup. When they are younger girls, they want the best of everything, although their pocketbooks are slim. These boxes show them different products in variety of colors. That way the girls can save their money to purchase the items that are best for them in the colors they prefer. I didn’t know that there was a box like this. I love learning about beauty products and how they are made. Knowing what is in my makeup and doing it myself would be awesome! The only thing I would not like to do is my own lip sticks. I would love making other things with my daughters to share with their friends. This sounds like a neat box to get! I’m not sure how I feel about DIY make up. I’d worry about messing it up. This is one Subscription box I really want to try indeed. I have been wanting to make my own beauty products and now I can do it hassle free. Thanks so much for sharing. This looks way too cool!! 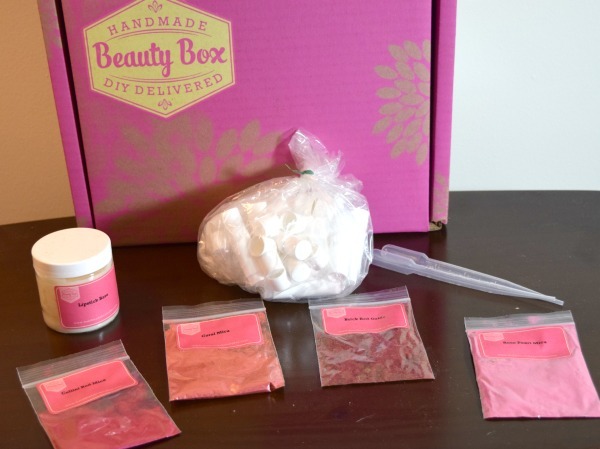 I love DIY and everything and anything beauty so this subscription box was like made for me!! Making my own beauty products has always been a dream of mine, so maybe this would give me a taste of my dream job hah. This Handmade Beauty Box is Amazing. I always prefer to make my own beauty items, but sometimes chasing down all of the ingredients from so many different stores is exhausting, and I end up empty handed. This is a perfect solution because everything is readily available when opening the box. This Handmade Beauty Box is truly amazing. I always prefer to make my own beauty items, but sometimes chasing down all of the ingredients from so many different stores is exhausting, and I end up empty handed. This is a perfect solution because everything is readily available when opening the box. This subscription box service looks very interesting. Thanks for sharing! I’m really interested in the subscription box craze, but had never heard of this one before. I love the idea of hand-crafted goodies but I’m not very creative so this box is perfect for people like me. This looks like fun. I would really like to make my own vegan lipstick, because it’s such a fortune to purchase. This beauty box is right up my alley. My 3 granddaughters, daughter and I already get together monthly for a craft night. This particular box would be wonderful to start them on making their own beauty products. I like this great and nice idea to make this beauty box. I am going to start Monday, and I thank you so much. i like it! hoping that i can able to buy to try to making it natural beauty product.. GREAT!